The Player now started without the ability to construct any buildings. New buildings (and citizens) were unlocked as they appeared in the tutorial, and the remaining buildings (school, warehouse, inn) were unlocked when the tutorial was completed. I also added a menu option to turn on / off the tutorial, default is on. Buildings that are destroyed now drop their inventory and return some of their building materials. Serfs carrying an item will also drop that item. The items are put into a “lootbox”. I decided to call them “lootbox” for the meme, but the name was appropriate anyways. Implementing this was somehow a lot more work than I had anticipated, and I had to deal with a few bugs that were created alongside the feature, but it was an absolute necessity I believe. This video demonstrates the funny bug (there were non-funny ones as well) I mentioned earlier. The issue was that the lootbox – which inherits from Lot, just as buildings and constructionsites – created a new lootbox whenever it was destroyed. This resulted in infinite lootboxes, which were always a fraction of the size of the previous one. At one point I deleted the lootbox 16 times until I couldn’t find it anymore, at 15 and 16 times it was already just a single pixel large. Lootboxes blocked building space, and created high priority push jobs, so serfs would empty them as quickly as possible. The lootbox would disappear after 90 seconds or when the last item was taken out of it. The 90 second lifetime is represented by the healthbar dropping every second. This means enemies can destroy the lootboxes as well. Manually destroying it was also an option, which would mean the player lost the items that remained in it. 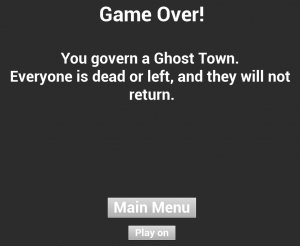 If the player had no citizens remaining, and there was no gold in a school to create new ones, the player would now game over. They could choose to “continue playing”, looking at the map, or return to the main menu from there. 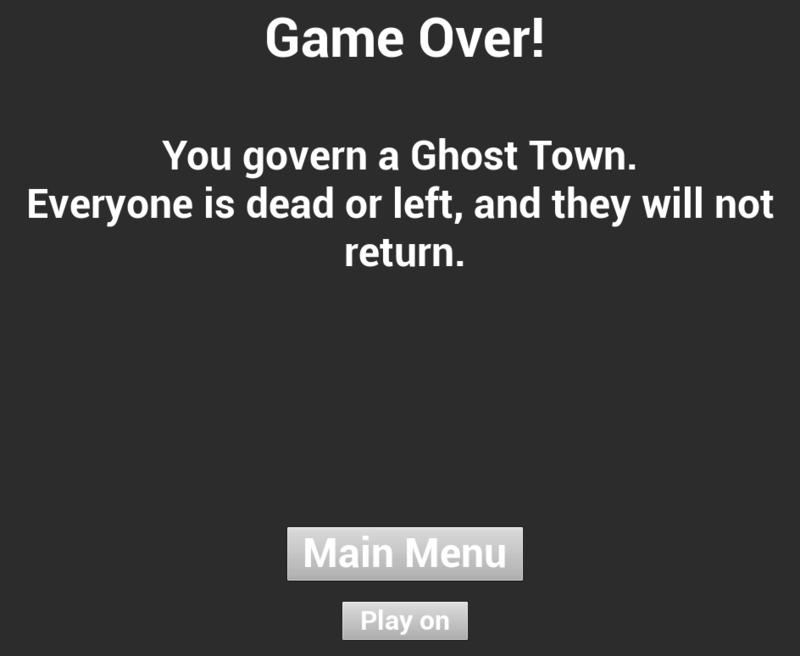 Although I’d never seen this happen in a game, I decided to implement it, so the player would know for sure that there was no way to keep playing from there. I had thought about additional conditions, such as losing the warehouse, the school, or all builders and the school, or any way to produce lumber. However there would still be the chance to recover and rebuild for the player in most of these cases. If there were no citizens however, there would be no way to recover in any case. I oriented myself on a mix of Unreal’s and Total War:War Hammer’s tooltips, to improve my own. 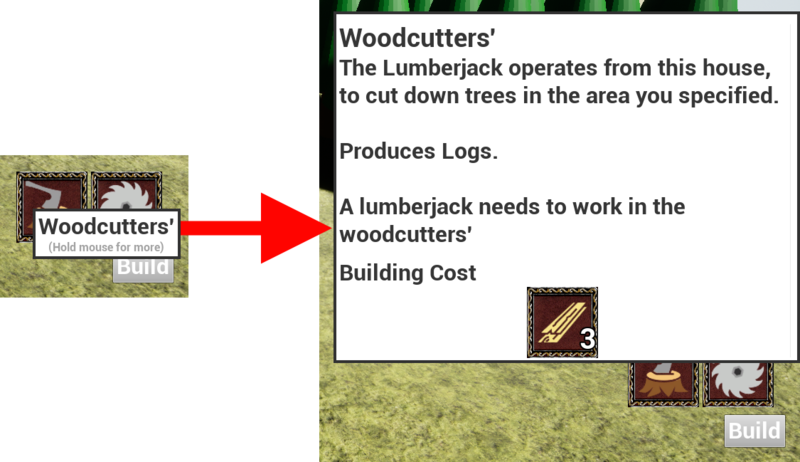 Basic -> Advanced Tooltip of the Woodcutters’ Building in the Building Browser. I implemented edge scrolling (mouse on screen-edge) and finally fixed the mouse wheel scroll too. This meant the player could move along the three axes with the mouse, irrelevant of their camera angle. I added two clocks to the HUD, below the Gamespeed section. One clock shows the current game time, and the other the real-time elapsed since the game was started. These are mainly for debugging purposes, or for playtesting. When their current job is invalidated, Serfs carrying an item would now try to find a new pulljob for this item, deposit it at a warehouse or, if all else failed, drop it as lootbox on the floor. 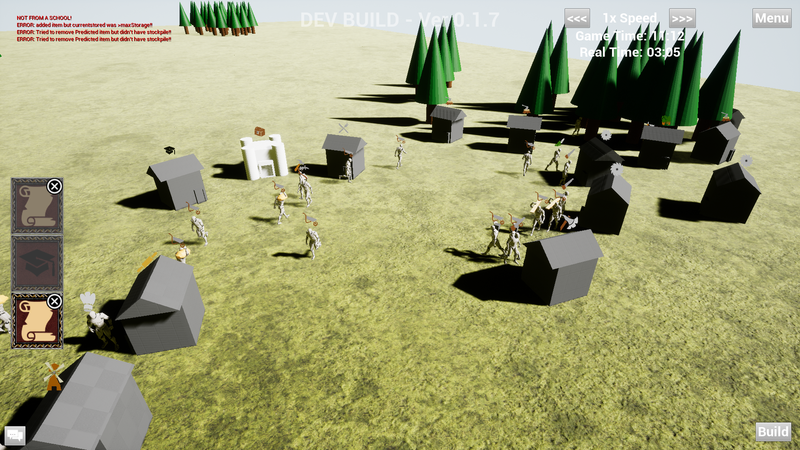 During these two weeks I had to face the reality that if I did implement the features I had still planned, such as combat, the game would not be as polished an experience as I set out to create. So I decided to drop some of them, in favor of more polish in terms of UX. For the final presentation I made the narrative that the game is a sort of “base level simulation sandbox”, upon which different kinds of games could be built now. 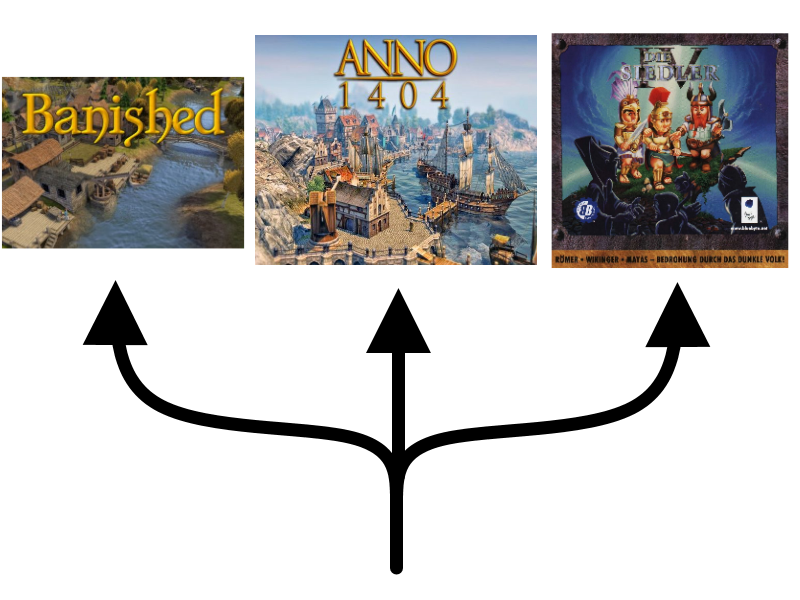 The three main games that came to mind for me were Banished, Anno and the Older Settlers games. Banished, which is all about food and bare necessities, focusses on survival. Here, the goal is only to grow your city’s population carefully, and fighting the harsh environment. The Settlers (IV in particular) is all about the weapons. Although there are exceptions, every mission usually has some opposing player that needs to be defeated by superior military force. 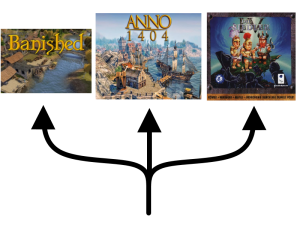 Anno (1404 in particular) is inbetween the two. While you can, and sometimes have to build an army and a fleet, the focus absolutely lies in optimizing the economy to have as many citizens as you can fit on an island. There were a few people, during the last few months, who suggested leaving combat out of the game entirely, however I never even considered it, as I had a crystal clear idea of what I wanted the game to be. By now I have noticed a few things that simply aren’t great game design. I oriented myself on older games, but some games had already modernized aspects of the game, which was one of my goals with this project. For instance in The Settlers 6, you no longer need to create the specific citizens who work in buildings. Instead they automatically appear from the warehouse when their building is constructed. This removes one of the more complicated and frankly unnecessarily complicated features from the game. Of course this doesn’t necessarily mean my game design decision was wrong or worse, but the point is I hadn’t even considered it. I still want to continue working on this game after this semester, however I will have to reconsider the game design from the ground up, hopefully get a game designer involved, or someone else (programmer or artist) that has a similar interest in this genre as I do.